Sept 20 – Dec 1, 2018 in New York “The accumulated Mexican cultural heritage is revealed in intense and sublime characteristics in the photographic works of Lola Alvarez Bravo and Mariana Yampolsky, masters of the use of photography to express the human and visual sides of Mexican culture.” –Spencer Throckmorton NEW YORK September 2018 – From September 20 through December 1, 2018 Throckmorton Fine Art (www.throckmorton–nyc.com) will host a ‘visual dialogue’ between two master photographers whose attraction to Mexico’s diverse cultures sparked a unique bond between them during the decades of their friendship. LOLA ALVAREZ BRAVO, Maria-Izquierdo, 1940. Gelatin-silver print, 10″ x 7.5″. Born a quarter century apart, Lola Alvarez Bravo in Mexico in 1903 (or 1907 by some accounts) and Mariana Yampolsky in Chicago in 1925, each used their photographic talents to portray human reality in ways that reflected their response to the indigenous cultures and people they met during many trips through Mexico. Unlike the works of esteemed artists such as Diego Rivera, Hugo Brehme, Claude-Joseph-Desire Charnay, Guillermo Kahlo, Edward Weston and Tina Modotti, who often portrayed political messages in their work, Lola and Mariana shared an affinity for and empathy with Mexican peasantry, shooting spontaneously and with great respect at a time when Mexico was just coming out of a revolution and experiencing rapid growth. Spencer Throckmorton says, “Lola and Mariana came from very different worlds. At times Lola functioned as Mariana’s mentor or teacher. Their shared love of Mexico and Mexican culture forged a friendship that lasted a lifetime.” Lola, born Delores Martinez de Anda in Jalisco, was orphaned at a young age, winding up with an older brother in Mexico City. She married her long-time friend, the renowned artist Manuel Alvarez Bravo, in 1925. Each was a self-taught photographer. Lola not only assisted Manuel with lab work but also opened a gallery in Mexico City, where both became acquainted with the artists of the time, among them Maria Izquierdo, Lupe Marin, Diego Rivera, and Rufino Tamayo. As her talents developed, Lola experimented with photomontage and cinematography. 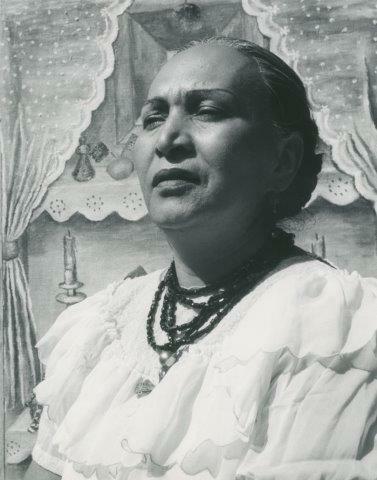 Her only short film, “Chapingo,” deals with Diego Rivera’s murals al fresco technique in Chapingo’s chapel, which deeply touched Lola, as did the cinematography medium itself. Lola Alvarez Bravo did a great number of portraits and also complete body figures. At some point the elegance and the surreal Mexican atmosphere became one in the photographs she took of women in reclining diagonal positions. 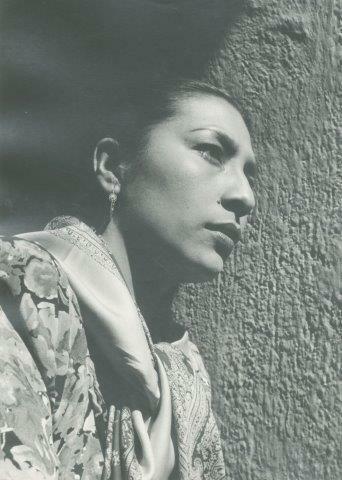 This is seen in one of the most renowned photographs, of Isabel Villasenor, “The Dream” of 1941. Villasenor was a painter, actress and poet and married to the painter Gabriel Fernandez Ledesma. Olga Tamayo’s portrait in the 1940s has a similar interest in breaking the central and classical composition. Lola also photographed men asleep, in “Laziness,” and in “Asleep (under the truck).” One of her most famous portraits is of Frida Kahlo, the Mexican artist, dressed in black with the windowed mirror and the escuincles, her two little dogs, circa 1944. For Lola the portraits were to capture the physiognomic signs and the distinctive expressions, as in a three-quarter profile of Maria Izguierdo, 1940, and a face in complete profile in “Alfa Henestrosa,” 1950. Her Francisco Toledo image from the 1970s/80s is a symbolic photograph, one that goes far more than registering face signs of the master artist. The body frontal with a subtle inclination towards the right of the viewer creates a “X” with the head towards the left. Such a confrontation reveals his intense personality, and the dominant power he has as a world-renowned artist, and a local leader. In Throckmorton’s “Visual Dialogue” between Mariana’s and Lola’s photographs, Mariana also approaches non-frontal interesting angles in “The Bread, Mexico” 1992. The man is presenting the bread and holding the basket in a daily scene. Three vertical elements: both walls and the man, create the balance with the symbolic horizontal and oval container. Food, survival, for the buyer and the seller, are framed by rich textures in a light and shadow image. A similar composition of the areas dividing the photo is in “Morning Breakfast,” of 1984. It is a highly reproduced work by Yampolsky with an unusual distant scene. MARIANA YAMPOLSKY, Dancer with Bicycle, 1991. Gelatin-silver print, 14″ x 18.25″. “Dancer with Bicycle” 1991 is a presentation of opposite elements, the indigenous traditional dress and mask, and the unstable transportation vehicle, meaning past and present time together. “Caricia/Caress” 1989 although not a self-portrait of Yampolsky, reveals her deep tenderness and love for the indigenous people of Mexico. This image is an intense contrasted light and shadow baroque result, one of those that doesn’t happen every day. If “Caress” signifies a natural attempt to register love, “The Beast,” 1988 expresses the opposite, the ferocious animal activity in contrasted dark environment, and inhabited by tensioned texture. Mariana Yampolsky was born in Chicago in 1925 to parents who had escaped from Europe and the Nazis. Her Russian emigre father Oscar was a sculptor and painter. Mariana was raised on her paternal grandparent’s farm. Her mother, Hedwig Urbach, came from the well-off intellectual family of a pioneer in Modern Anthropology, Franz Boas, who decisively influenced Mariana. In 1944, after graduating from the University of Chicago, Mariana heard about the Mexican muralist movement in a lecture she attended and made the decision to travel to Mexico. Although she spoke no Spanish she immersed herself in Mexican culture and its people. Through meetings with Pablo O’Higgins and Leopoldo Mendez she began to work at a printer’s space mostly devoted to labor unions and farmers. Her contact with the Popular Print Workshop or People’s Graphics Workshop (TGP), where she was the only woman at the time, put her in touch with accomplished artists who did prints, drawings, and paintings. Mariana remained active in the TGP from 1945 to 1960 and was a significant contributor as secretary, printer and exhibition organizer – plus doing her own prints. Her prints were powerful semi-abstract references to her political/social ideas. TGP artists worked quickly, didn’t number their prints, and sometimes forgot to sign their works. They also charged very little, many times giving their artwork for free to workers and social activists. Soon after Mariana left the TGP she was hired as the photographer for a two-volume book The Ephemeral and the Eternal in Mexican Popular Art. Her career evolved, and she found herself working in photography, prints, editorial, organizing exhibitions and writing. Mariana’s photography focuses on the architecture of rural Mexico and the faded majesty of Mexico’s colonial plantations. Her images of poverty-stricken peasants and the wives and mothers whose husbands have left them to find work in the cites, share a quality of timelessness and a tenacity with which history and traditions survive in contemporary Mexican life. Two prints by Mariana and Lola have much in common, although with a time difference of sixteen years. The pair of images could be called ‘women by women’. They involve two models and two authors, but there was no call of feminist concerns. Women were hard workers, carrying and passing on their traditions. “Yalalag. Oaxaca” 1946 by Lola Alvarez Bravo is a gelatin silver print using a diagonal composition but articulating triangles and rectangles in baroque contrasts. Thematically, here is a standing woman displaying the goods of Oaxacan women’s clothing. The photo doesn’t refer poverty but the woman with her hand on her face insinuates concerns, things she is preoccupied with. No doubt the situation deals with the singular and the plural, meaning with herself and with the indigenous people that then and still now are not respected, not protected. 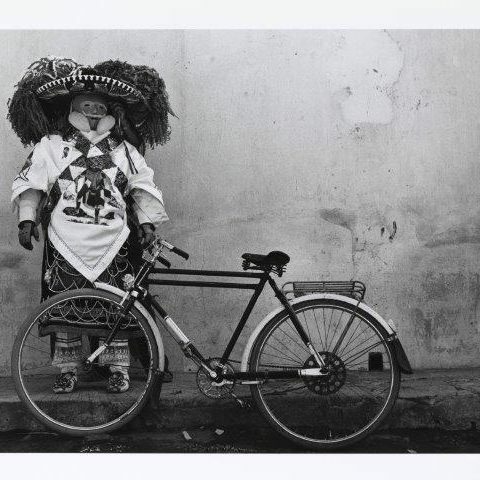 “Covering Huipil,” 1962 by Mariana Yampolsky is also an image taken in Oaxaca. This vintage gelatin silver print is one of Mariana’s most well-known pieces – a complex composition one can say, a battle of forces – between light and shadow. The shoeless woman walks. From the feet up, she seems to be a dark column until the huipil blows away from her body creating a volumetric thing, like an opened bird wing. On the side, almost opposed to her, is a dark vertically diagonal column with complex bits and pieces. It is a shadow that part of the construction ceiling projects on the light external wall. “Covering Huipil” is a constant confrontation of opposite pairs of light and shadow, even the way the mountains and sky are pictured. Both Lola and Mariana had naturally accumulated heritage. Both managed ways to inherit it. Each accessed this heritage with their creative spirit, freedom, personal curiosity, respect and good humor. Together they understood that photography is a medium with no end.